Apple on Tuesday released a number of updates for devices running OS X, including a 2013-004 Java update and new drivers for printers from Canon and HP. There were two Java updates issued on Tuesday. The first is Java for OS X 2013-004, and it delivers "improved security, reliability, and compatibility by updating Java SE 6 to 1.6.0_51." The update corrects an issue with Java applications failing to draw or respond to user input, and it updates the Java SE 6 applet plug-n for systems that do not already have Java for OS X 2012-006 installed. The update is available as a free download at Apple's support page. It is a 64.02MB download that requires a device running OS X Lion 10.7 or OS X Mountain Lion 10.8 or later. 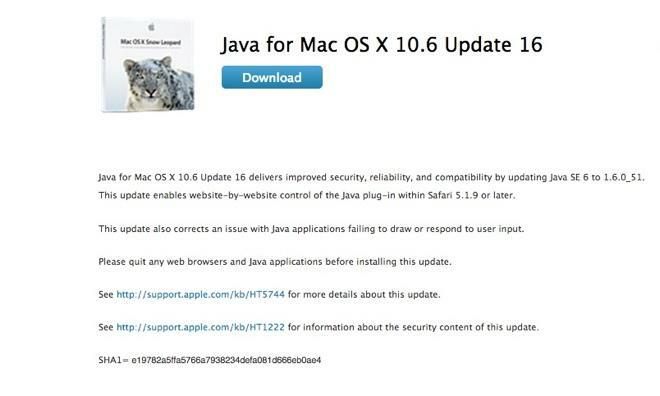 Apple also released a Java for Mac OS X 10.6 Update. Update 16 accomplishes much of the same as the aforementioned update, tailored to Macs running OS X 10.6.8 Snow Leopard. It is available at Apple's support page as a 69.47MB free download. Tuesday's printer driver update includes HP Printer Drivers 2.14, which brings the latest HP printing and scanning software for OS X Mountain Lion, OS X Lion, and OS X Snow Leopard. It is a free download measuring 470.43MB. Also updated were drivers for Canon laser printers. Version 2.11 for OS X installs the latest software for Canon laser printers and scanners. The 28.82MB download is available for free from Apple, and it requires a device running Mountain Lion, Lion, Snow Leopard, or later.